You read that right. Spain just hit 6 goals against this year's world cup finalists, and technically, the second-best team in the world. 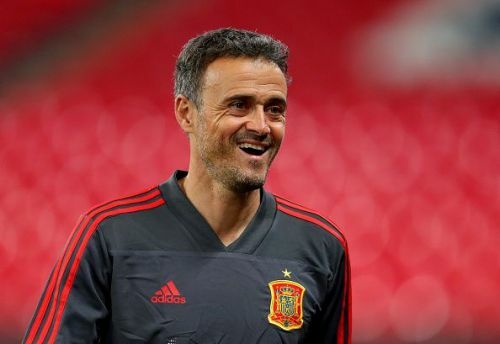 Just a couple of months after an embarrassing defeat in the round-of-16 of the world cup on penalties against the hosts Russia, Spain have risen again under new manager Luis Enrique. Spain, throughout the course of the game, maintained a high intensity of pressing, a hallmark of the Luis Enrique-style of football. The famous Barca side that won the treble in 2015 in Enrique's first season in charge found tremendous success in incorporating this style. Constant pressing allowed very little time for their opponents to think and forced them to make silly giveaways. These often led to some tremendous counter-attacking play by their front three of Messi, Suarez, and Neymar. Spain played in very similar fashion tonight which was facilitated by the inclusion of Real Madrid midfielder Dani Ceballos. The 21-year-old ran his lungs out on the field, chasing and harrowing the Croatian midfield. A moment that sums this up perfectly came in the 88th minute when Ceballos charged at the Croation player with the ball in his defensive half, despite the fact that his team was 6-0 up with just two minutes on the clock. He took the ball away and nutmegged another player to pass it back to Sergio Ramos- the best highlight of the game for the young midfielder. It doesn't come as a surprise that Enrique has incorporated his style into the team- players like Ceballos, and Busquets with whom Enrique won the treble at Barca, allow him to play this way. As a result of this system, players like Isco, Asensio, and Tiago have more time on the ball and the effect of that is clearly reflected by the scoreline. If they continue to flourish under this system, these players can certainly replicate the success of the previous generation of Spanish footballers.